A Month of Beautiful Giveaways is a very special feature here on The Beauty of Life! Throughout the month of August, I will be giving away an array of unbelievable beauty prizes from some of my all-time favorite brands. Check back for your chance to win each day! Want to reduce the signs of aging? (Um, who doesn't?) 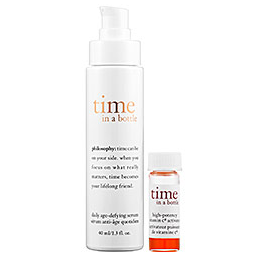 Then Philosophy Time In A Bottle is the product you NEED to try. This serum works to defy the appearance of aging, thanks to a breakthrough DNA renewal complex and a high-potency Vitamin C8 activator. Basically, you'll look and feel younger the more you use it -- not to mention your skin will look radiant, poreless and wrinkle-free! And here's the best part. Three winners will receive this product today! This giveaway has a retail value of $74. To enter, use the Rafflecopter widget below. Good luck! This giveaway ends on Friday, August 2 at midnight. Three winners will be chosen AT RANDOM on Saturday, August 3. Multiple entries will be disqualified. Giveaway is open to US residents only. What a nice giveaway! I would love to try this. My biggest skin worry is definitely seeing little fine lines start to creep in. The pressure is on for developing a good, lasting skin routine! Biggest skincare concern at the moment is uneven skin. Looking tired is my biggest skin problem. My biggest skin concern is aging lines. Would love to try this product! i really love the idea of it leaving my skin both poreless and wrinkle free. As i have big pores and my premature wrinkles are starting to set in. redness. lots of redness. and fine lines. Hard to pick just one but I will say sallow/lifeless skin. My biggest issue is lines and wrinkles. dry skin is my biggest skin problem. dull, uneven skin tone and first signs of wrinkles. My biggest concerns are the wrinkles around my mouth and eyes. I wold love to try this! Oily skin and large pores. Can I roll them into 1? Aging, sun damage, wrinkles and crepey eyes. (maybe creepy too, but that's subjective). My biggest skincare concern is premature aging. I have SO MANY wrinkles, I really need help - big time. I think my skin has been looking really tired and dry recently. My biggest worry is that I will eventually not look my age & began to look much older than I am ! I just want to stay beautiful , the fine lines that creep up on us can be defeated somehow but we must learn our skin to help control that ! I love anything by Philosopy. Can't spell it but I love it. BloomOver50@yahoo.com. I don't have an instagram account. Please don't let this hurt me in winning. I have really bad sun damage from years of no sunscreen that is starting to irritate me. My biggest concern is the uneven splotches. My biggest concern is early sign of aging - getting wrinkles now. Large pores are my biggest issue. My biggest concern is redness. I have really sensitive skin that can get quite red at times. I have oily skin, expecially around my nose. I have dry patches and oily patches. It's hard to know what products to use. I have start4ed getting wrinkles, especially around my eyes. My skincare concerns are crows feet and laugh lines. Fine lines around the eyes! My biggest concern is dry, flaky skin. Vitiligo is my biggest skincare concern.